Yes, everything is designed and handcrafted by me. I only make things I love, and I hope you love them too. If you can't see quite what you're looking for, please email me and together we'll create it for you. Pure 999 Silver wire is generally too soft for making delicate jewellery findings and can easily bend out of shape. To make it stronger, 925 Sterling Silver contains 92.5% pure silver plus 7.5% other metal (usually copper), giving it increased strength whilst preserving its ductility and the beauty of a precious metal. We source only nickel-free components and do additional spot tests on any suspect items. Unfortunately not all suppliers are as diligent, so we cannot guarantee something wouldn't slip through. However, we will happily check and rectify any item that you believe contains nickel. All payments are handled securely through the PayPal site. We don't see any of your payment details, so it's a fast and safe way for you to pay. If you don't already have a PayPal account it's easy to set one up, and you can pay by credit or debit card at no extra cost to you. Each voucher has a unique code, which is redeemable against purchases at the checkout. No change will be given for purchases totalling less than the voucher amount. Vouchers can only be used against purchases on the Jewellery by Rebecca website; cannot be exchanged for money; and are valid for 12 months from the date of purchase only. Are Cookies Good For Me? This site uses a cookie to remember the contents of your shopping basket. Cookies are small text files that are placed on your machine to help the website provide better browsing experience. However, you may prefer to disable cookies on this site, and on others. The most effective way to do this is to disable cookies in your browser. We suggest consulting the Help section of your internet browser. May's birthstone and used to commemorate 35th Wedding Anniversaries. Emerald is one of the five Precious gemstones of the world; and the most highly valued of the Beryl family. The green colouring of Emerald is caused by trace amounts of chromium and vanadium, and the quality of the colour determines the value of the gemstone to the greatest extent. It naturally contains inclusions, so unlike other gemstones, these inclusions do not devalue the Emerald, they are part of its natural character and beauty. Often Emeralds are 'stabilised' before setting into jewellery, by immersing them in colourless oil or resin, which strengthens the internal structure. Special care should be taken when cleaning Emeralds, as these oils can be stripped out of the stone and it will need to be re-oiled again. Famous Emeralds include a suite of Emerald jewellery called the 'Cambridge and Delhi Dunbar Parure' which is Queen Elizabeth II private collection, and an Emerald and diamond brooch that Richard Burton gave to Elizabeth Taylor as an engagement present. Emeralds were highly prized by the Ancient Egyptians, and the oldest mines next to the Red Sea were referred to as Cleopatra's Mines. January's birthstone. Garnet is also given as a 2nd Wedding Anniversary gift. It is believed to protect the wearer from nightmares and snakebites, and offers guidance in the dark. Garnet is a semi-precious gemstone, and its use in jewellery dates back to the Bronze Age and is often found archeologically in Greek and Roman jewellery. When you think of Garnet you picture a deep claret red gemstone, but in fact Garnet occurs naturally in a vast range of colours. 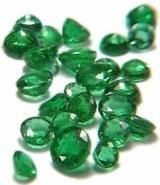 The most valuable form is Dermatoid Garnet, which is actually bright emerald green in colour. All forms of Garnet are very hard, and lend themselves to all forms of gemstone cuts from smooth soft cabochons to highly faceted intricate shapes. Some pieces of Almandine Garnet contain Asbestos fibres, and when expertly cut can create the highly prized 'Star' cut. In 1996 a university student in central Australia discovered what is believed to be the largest single garnet find ever. This giant rough is thought to weigh thousands of tons and measures nearly a hundred feet across. February's birthstone. 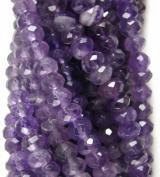 Amethyst was once classified as a Precious gemstone, alongside Emerald, Ruby, Sapphire and Diamond. Then in the early part of the 1800's, large deposits were discovered in Brazil and Uruguay, and it was reclassified as Semi-Precious. Although it is no longer rare by gemstone standards, it is the most valuable form of the Quartz family. It has excellent hardness which makes it perfect for cutting into a wide variety of shapes from soft smooth cabochons to highly faceted fancy shapes. The beautiful colour comes from the iron content of the quartz and varies greatly within the purple colour range from pale lilac known as 'Rose de France' to the ultimate 'Deep Siberian', and also heavily banded pieces which are often described as 'dog tooth' or 'chevron' Amethyst. This gem is believed to imbue the wearer with a sense of inner peace, balance and serenity. The Ancient Greeks associated Amethyst with wine and, a little oddly, with sobriety, and even made Amethyst goblets to serve wine in. 25th anniversary. Silver is one of those ambiguous terms, describing to both the actual metal and the shinny grey colour (which should more properly be referred to as 'silver coloured' or 'silver tone'). Pure 999 silver is generally far too soft for use in jewellery making and easily bends out-of-shape and breaks. To make it stronger, 925 Sterling Silver contains 92.5% pure silver plus 7.5% other metal (usually copper), giving it increased strength whilst preserving its ductility and the beauty of a precious metal. 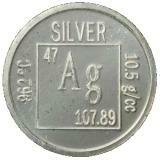 Silver is also a component of almost all coloured carat gold alloys, giving them a paler colour and greater hardness. White 9 carat gold contains 62.5% silver and 37.5% gold, while 22 carat gold contains up to 91.7% gold and 8.3% of silver/copper mix. December's Birthstone. Tanzanite was discovered in 1967, in an area just 5 miles square amongst the foothills of Mt Kilimanjaro in Tanzania. It has never been found anywhere else in the world, and that is just one of the properties that has elevated this amazing gemstone to the rank of Precious, alongside Ruby, Sapphire, Emerald and Diamond. Tiffany & Co instantly recognised the beauty and value of this extremely rare form of the Zoisite family. They gave it its name 'Tanzanite' and were the first to market it. 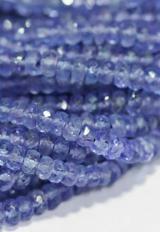 Tanzanite is a pleochroic gemstone, meaning that any one gem can display a range of colours. In the case of Tanzanite it is not unusual to see colours from Cornflower Blue to Violet simultaneously. One of the most famous Tanzanites in the world is the 'Queen of Kilimanjaro'. It weighs 242 carats and is set in a tiara accented with 803 garnets and 913 diamonds. The piece is part of the private collection of the first CEO of Apple Computers. Something to bear in mind with Tanzanite, is that being from a single location, the mines will eventually run dry, and the cost of this unique, spectacular, Precious gemstone will skyrocket. April's birthstone and also a gift for 10th and more traditionally 60th Wedding Anniversaries. Diamond is one of the 'big 5' Precious gemstones. The name Diamond comes from the Greek word 'adamas', which means invincible. It is made from pure carbon, and is the hardest mineral known to man, being 10 on the Mohs scale of hardness. It is used in industrial processes, most notably to cut glass. Diamonds can only be cut by other diamonds. The classic cut for diamonds is the round 'brilliant' cut, which as the name suggests, allows the maximum amount of light to scatter from the pavilion of the diamond. It was developed by mathematician Marcel Tolkowsky, and there are strict mathematical ratios to follow to get the best results. 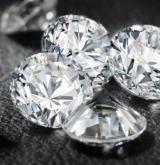 Sometimes diamonds are cut not in accordance to these calculations, so that the end result has a higher carat weight, but this greatly depletes the refractive properties of the gem. Gemstones, particularly diamonds, are valued according to the 4 C's, Cut, Colour, Clarity and Carat Weight, so increasing the carat weight at the expense of the cut doesn't necessarily increase the value of the diamond. Diamonds are often surrounded by mystery and intrigue, probably because they are so rare and valuable. The largest faceted diamond in the world is called the Golden Jubilee, it is 545.65 carats, and is part of the Crown Jewels Thailand. Champagne diamonds range from light straw in colour to cognac, they have an exceptional 'fire' and refractive index. Black diamonds are actually full of dark inclusions, which makes them less refractive, but gives them an almost metallic lustre. August's birthstone. 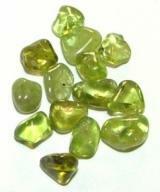 Peridot is quite unusual in that it occurs in only one colour, green, ranging from yellowish green, to olive. The intensity of colour depends upon the level of iron it contains, and man has found no way of improving it's colour unlike many other gemstones. It comes from the Olivine group of gems, which are quite common in volcanic material and interestingly, meteorites. Having said that, gem quality Peridot is actually very rare. The oldest deposit, mined for 3500 years is on the volcanic island of Zabargad, in the Red Sea off Egypt, and legend has it that Peridot was a favourite gemstone of Cleopatra, though she may have thought they were Emeralds at the time. Napoleon Bonaparte also gave Josaphine Peridots to express his undying love and admiration for her, but obviously this was before he had their marriage annulled!! July's birthsone. These undyed and unheat-treated Rubies are exclusively from the Longido Mine in Tanzania. The Ruby deposits at Longido were originally discovered in 1949 by Tom Blevins, an English gem hunter, in a sink hole on the slopes facing Mount Kilimanjaro. This mine is famous for its glorious naturally raspberry red rubies - requiring no heat treatment or dying to achieve their stunning colour. Always remember to put them on after you have applied your makeup, perfume or hair products and they will give you years and years of pleasure. September's birthstone. Sapphire is one of the three gemstones traditionally classified as 'Precious', alongside Diamond and Ruby. 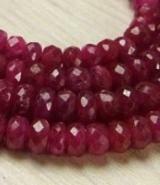 In fact, Sapphire and Ruby are the same material, Corundum, but Ruby is always red, whereas Sapphire spans a wide colour range from reddish orange through to purple, depending on the other elements it contains. Clear or 'white' Sapphires are nearly always synthetic, or 'created' in a lab. The most popular colour is blue, and some of the worlds largest and most famous Sapphires are also blue. Sapphires are mined in Thailand, Sri Lanka, Burma, India, Australia, America, Tanzania, Cambodia and Madagascar, though Burma and Kashmir are now producing very little material. Most Sapphires are heat treated to improve the colour. Stones are subjected to temperatures between 1700 and 1800 degrees Celsius for several hours. Beryllium can also be added during heating to reduce the blue tones in yellowish stones, making them appear a more brilliant yellow-orange. March's birthstone. Aquamarine is part of the beautiful Beryl family of gemstones which includes treasures such as Precious Emerald, soft pink Morganite, colourless Goshenite and Golden Beryl. Aquamarine gets its name from the soft, ethereal, blue/green colour which is caused by the iron content in the crystal structure. 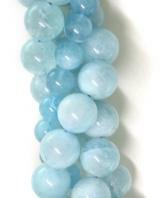 High value Aquamarine stones have excellent clarity. These tend to be cut for faceting and set in jewellery. 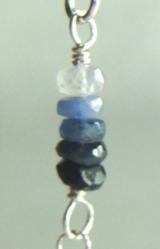 Stones with more turbidity are usually cabochon cut, or made into beads for stringing. The largest Aquamarine ever cut is the Dom Pedro. It weighed 26kg, and was cut into an obelisk and donated to the Smithsonian Museum in America. Legend has it that Aquamarine is the 'treasure of Mermaids', and sailors carried it to protect against drowning. It is said to instil courage, reduce stress and give the wearer the strength to deal with difficult situations.